Below you will find a C# code fragment of the actual Performance Visualizer that implements the Megan ratio as presented in the article by Oscar. G. Cagigas. Nonetheless, we've taken the trouble of coding for you – there's only one step left to power your analysis with the Megan ratio. Select «Extension Manager» from the Tools menu and notice an update available to the open source Community.Visualizers library which includes the Megan ratio. (If you haven't already done so, get the library for free from the http://www.wealth-lab.com site.) After updating, any Strategy running in Portfolio Simulation mode can benefit from another view on its profitability analysis. Figure 1. A Strategy window in Wealth-Lab Developer 6 featuring the Megan ratio. 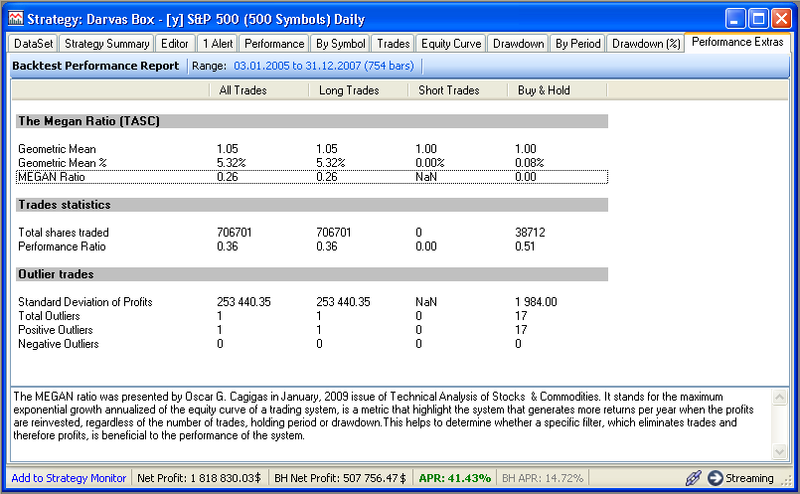 However, a trader should keep in mind that there are drawbacks to this performance metric. First and foremost, it doesn't take into account the risk side of the equation. And by design, it seems to favor strategies that continuously reinvest profits. Please log in to the Wiki to see Strategy code.